Easily render your documents to submission ready PDF formats for health authorities anywhere in the world like FDA, EMA, PMDA and more. Easily monitor, identify, convert and store the conversations with external bodies in appropriate repositories. Convert your documents and valuable content into future-proof formats like PDF & PDF/A for archival purposes. Your data in unstructured file formats? Transform them easily into workable formats for AI, IDMP or other purposes. Specify PDF version for output, apply complex bookmarking, gain control over the style of some output elements (bookmarks, hyperlinks), specify font embedding usage, add & remove security options and perform much more with Advanced Rendering. Generate standard forms, reports, statements (Application Forms, CRF’s) automatically and eliminate human error. Seeking to improve your regulatory processes? See our Webinar. With DocShifter, you can specify the output to comply with the local regulatory authorities. You can create PDF to correct compliant version (1.4 – 1.7 or PDF/A) depending on the region, control region specific features (opening bookmarks to specific level only for clean initial view for Japan or grouping bookmarks to ease navigations for Japan) or optimize output for fast web viewing. DocShifter also fully supports double-byte content. With the intuitive, web-based drag & drop interface, DocShifter offers a unique ability to save & configure reusable workflows. The obligation to reconfigure the tools every single time to different health authorities, is no more needed. While rendering from one format to another, native applications that can read & open the source format are frequently needed. DocShifter, with its innovative technology, eliminates this need and can render from any-to-any without the need of having the native application installed on your computer or the server, saving your organization operational costs. DocShifter is a cloud ready, platform independent solution and can be connected with multiple document management and regulatory information platforms easily. 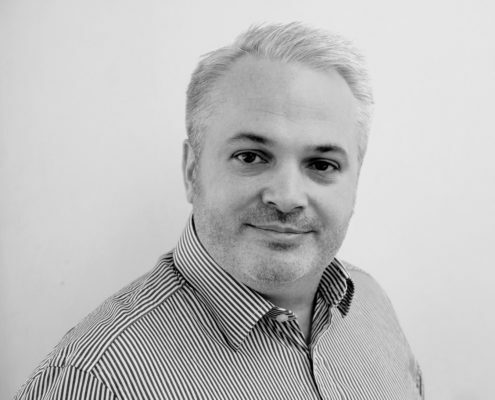 (OpenText Documentum, Veeva, Box, Alfresco, Generis, Microsoft Sharepoint e.g) The open API / REST services allow the integration and connection with platforms that are supported out of the box. The DocShifter solution is also ready to run in containers. Why switch to DocShifter today? Are you looking for a solution to create compliant output for regulatory health authorities? Are you looking for a solution to process & standardize your communication for correspondence tracking? Are you looking for a reliable solution for all your content transformation and advanced rendering requests? DocShifter is a highly scalable document transformation solution with an intuitive drag & drop interface that performs any-to-any and any-to-PDF transformation for Life Sciences. These transformation capabilities include but are not limited to: images, videos, pdfs, unstructured data. Understanding your regulatory submission and other regulatory content challenges, DocShifter solution brings innovative approaches with advanced document rendering, email processing for correspondence tracking, unlocking unstructured data by content transformation. Our goal at DocShifter is to ensure the sustainability of your documents by advanced document rendering & document transformation and document enrichment. DocShifter for Life-Sciences for Pharmaceutical, Biotechnology and Medical Devices Manufacturers provides advanced rendering software (hi-fi rendering) that creates compliant, submission ready output for regulatory bodies all over the world such as PMDA, EMA, FDA. Correspondence tracking (correspondence management) to track any incoming communication and route it to appropriate directories and repositories is also a functionality. Automate the creation of forms. Lower total costs by optimizing your infrastructure and licencing fees. Secure your eCTD & other electronic submissions with DocShifter. Regulatory Information Management (RIM), Regulatory Operations and Regulatory Strategies Software, also known as Submission Publishing Software. Save time, resources and focus on your core work. 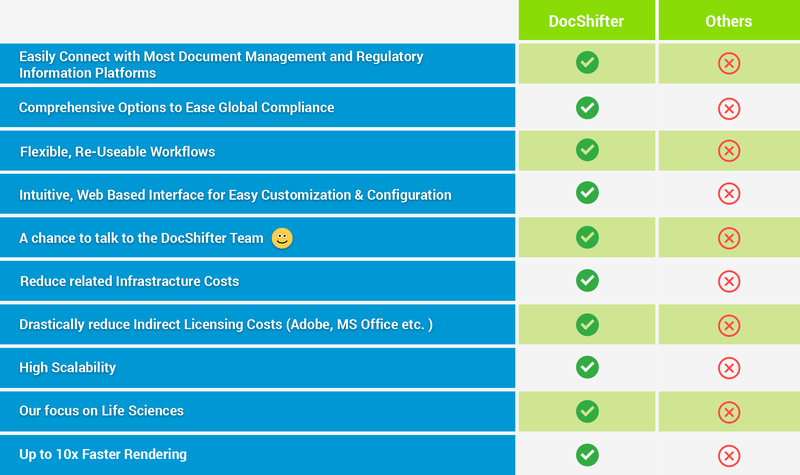 Transform to high quality, compliant, submission ready PDF’s with DocShifter. Advanced document rendering for Life Sciences. Fast, easy, automated.